This morning, the new iPod touch (s aapl) I ordered last week arrived at my home office. Although the device isn’t quite an iPhone 4 without the voice contract — no GPS, a low-res still camera and no IPS display come to mind — it’s close enough to complement my Android (s goog) phone. While mobile, I’ll use the free Wi-Fi hotspot feature that Froyo brings to my Nexus One and keep the iPod touch connected so I can test mobile apps for work. The device is impressively thin, and as it turns out, fits nicely in my iPad dock, turning the iPod touch into a hands-free video phone for me. 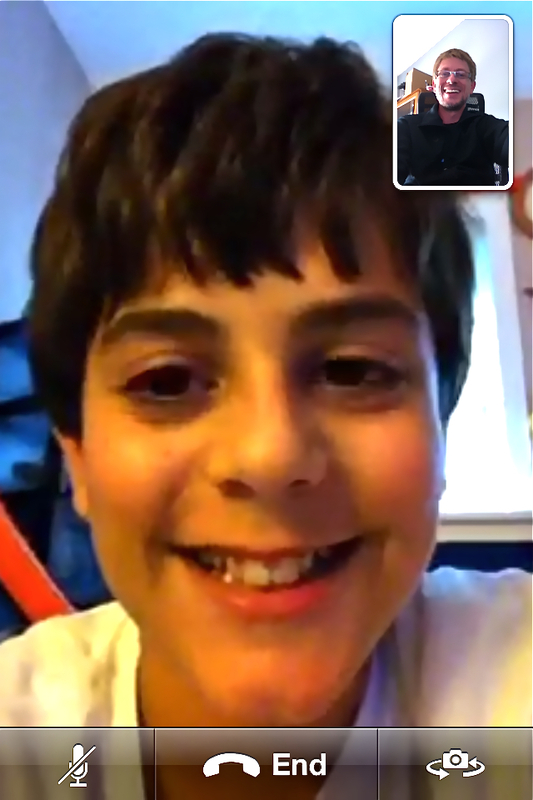 I don’t think it had been 15 minutes since I configured the device when my son surprised me with a FaceTime video call. Tyler just got an iPhone 4 for his birthday and was dying to try FaceTime, so he was tracking my iPod touch delivery in anticipation. It turns out that earlier this morning, Tyler got his first set of contact lenses. That was another surprise to me, because although I knew he was going for an eye exam, I figured he’d come home with new glasses. Since he lives a half-hour away with his mom, I wouldn’t have seen his two eyes with my four eyes if it wasn’t for FaceTime. Due to the simple nature of Apple’s video calling service, he was able to share the experience not long after it happened, with just a tap of the screen. That may sound silly, but it’s a blessing for a father who only sees his son every other week. I realize Apple didn’t invent video calling, and I’d never claim otherwise. I’ve used other software on different handheld devices for video calls in the past. I also know that in Europe and other areas outside the U.S., video calls on smartphones are fairly commonplace. Here in the U.S., it’s generally been a rare phenomenon only experienced by geeks like me, and that’s the difference. By making FaceTime simple to use and accessible on both the iPhone 4 and the new iPod touch, Apple is taking video calls to mainstream consumers. Once FaceTime moves from Wi-Fi to mobile broadband networks, I can just imagine the experiences: first steps, graduations, and other important moments in life shared via video calls. It’s a shame I lost my father last year, because I know he’d be amazed to see his grandson grow up through real-time video chats. I couldn’t care less which company brings video calls for me and my son to use; I’m just grateful to leverage the technology to share more meaningful time with my son without having to futz with apps, settings or devices. I’ll chime in on this. My son lives 2500 in Mexico with his mom. I see him once a month for a week. In the meantime it is long phone calls. We sometimes did an occasional skype or ichat video call, but the logistics were difficult and the quality poor. So these video calls had little effect on the father-son relationship. Its changed totally since I got my son a new ipod a month ago. He calls me every morning at breakfast time, which we now share. Two nights ago we did project together – a paper mache volcano, complete with explosion. Today, while I puttered around my apartment, he built things out of legos from the big “lego-discard” box. We were simply TOGETHER. You can’t imagine how wonderful this is. It is the same many nights — having him read to me, listening to him practice the violin, etc. PS. Facetime gives excellent audio quality over a not so great Mexican internet connection. This is absolutely crucial, since my son wears hearing aids, and every bit of audio information is precious. Sorry to read you lost your dad. Great you can maintain this relationship with your son! Facetime, as great as it is, is not the source of any great relationships, but a fantastic way to enhance communication among people. And for just 223$ (bit.ly/bhGETG) for the 8GB version, the iPod touch 4G is a very good deal. Wow, that was touching. You are a great father. Hope you guys will have more of those video calls. From one divorced father to another I cannot tell you how much just getting my kids iPhones 3G has improved my communication with them. Texting, playing games together (Words with friends, etc. ), sharing photos and more. Cannot wait to upgrade all of us to the iPhone 4 and FaceTime in the near future. Thanks for the interesting and significant, at least to me, article. No way, it is absolutely about tech since the “shared experience” is locked to proprietary hardware. FIRST you have to play the part of Apple salesman and convince everyone in your family to by an iPhone, THEN you may share your experiences. FaceTime uses open standards and protocols, it’s essentially up to other companies to utilize them which I’m sure they’re looking into. Todd, todd,todd. You are an idiot aren’t you? Apple announced open sourcing of facetime when they announced facetime. If only you knew what you were talking about instead of posting some idiotic assumption you wouldn’t sound like such a jackass. Apple may have announced that they would make the FaceTime protocol available to others, but they have not actually done it yet. Companies wanting to interoperate with it are reduced to guesswork and packet sniffing. I am not aware of any third party that has made a FaceTime call without apple hardware. I would be delighted to hear differently.